The ten-acre field in upstate South Carolina is not much different from hundreds of others dotted across the United States. The scene that unfolds on most days is not uncommon either, at least among bird dog owners. 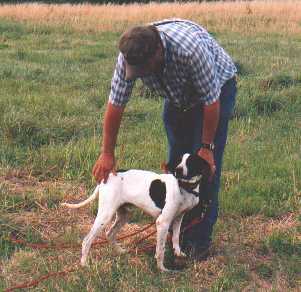 A trainer places a few pigeons in the grass, clips a check cord to a young pup's collar, judges the wind direction and begins methodically working the dog into a position where scent and nose meet. Standard fare, really, until you've been watching for a while and it dawns on you how incredibly quiet it is. This is the world of Maurice Lindley, professional dog trainer for the last twenty-two years. It is a world filled with the yelps and whines of eager pups, the longing whistles of stray quail looking for home, and the staccato flapping of wings as birds take to the air. Maurice knows these sounds well, but hears them now only through memory. In the mid-1990s, he contracted Meniere's Disease, also called Meniere's Syndrome. This inner-ear disorder results in a number of symptoms, the most severe being that suffered by Maurice: complete loss of hearing. Opinions vary about the cause, but the consensus is that once a person's hearing is gone, there is no cure. Although he still speaks as clearly as ever, he tends to talk more quietly because he cannot hear his own voice. Initially, his foremost concern was not his relationship with the dogs. "I was worried about how my customers would react," he says. "Fortunately, they didn't mind a bit." Technology such as e-mail and TTY telephones has broken many of the communication barriers with the dog owners. Yet communication, whether verbal, visual, or physical, remains the basis of dog training. Without a means of conveying his desires to the animal, a trainer must revert to the earliest days of the profession, when a dog was merely turned loose in a field with wild birds and genetics took over. It didn't take long for Maurice to realize that he had no way to be certain of how loudly he was speaking to the dogs. "Yelling tends to scare a dog, especially a young one. Even using a loud voice can have this effect," he explains. The dog's desire to learn is overcome by a desire to stay out of harm's way. This effect often results in what he calls a "flight reaction" in which the dog wants or even attempts to run away from the trainer. Not wanting to intentionally frighten a dog, Maurice began searching for methods that relied less on voice and more on other types of communication. Working with several trainers, among them Dave Walker, Bill Gibbons, Cliff Sharer, and Bill West, he approached the situation from a different perspective. Maurice makes an obvious but valid point when he says that dogs don't speak English. Though they may comprehend a few words, conversation is not a possibility. So rather than force his language on the dogs, he opened his mind to learn more about their language. What he found is that dogs are experts in communication; their preferred channels are visual and physical, not verbal, a preference that dovetails nicely with his own condition. Body language plays the leading role in the method he employs. Movements and postures quite often signal intent or desire. This applies to both of the parties (dog and trainer) involved in a training situation. Remember, this is a language and is used for communication, defined by Webster's as "a process by which information is exchanged between individuals through a common system of symbols, signs, or behavior (italics by the author). Maurice depends as much on a dog's behavior as a dog depends on his. Take as an example what happens when a dog points a bird in tall grass, keeping in mind that Maurice cannot hear the bird when it flushes. Approaching a dog on point, he must choose between watching the grass ahead of him and watching the dog beside him. If his focus is on the grass, he might miss the telltale signs that the dog is about to break. As is often the case when one of the five senses is lost, the remaining four become more acute. Maurice relies heavily on his sight in this situation, noticing things that many hunters and handlers fail to observe. "A dog will tell you when he's getting ready to move. I watch the feet and the joints just above the feet. When a foot lifts even a little, or when the angle in one of those joints changes, he's getting ready to go, and I give him a slight tug on the check cord before he breaks. It doesn't take much, just enough to let him know that I'm still here." The dog also tells him when the bird flushes. The ears perk up, the head jumps, and the eyes follow the flight path of the bird. The dogs pay attention to Maurice's body language as well. They monitor the direction he is facing as an indication of which way he intends to walk. He demonstrates this by slowly turning his back to a dog working the field in front of him. Momentarily, the dog glances at Maurice, does a double take, then quickly runs around and begins working in front of him. Maurice has not taken a step in any direction; he has simply changed his orientation. He brings the dog in and places him at heel. After explaining what just happened, Maurice points to the dog, which is now leaning against his leg. 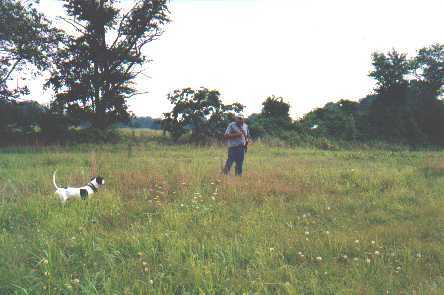 The dog is looking at the field, not at Maurice, and he explains that the contact with the leg is the dog's way of knowing when the trainer moves. He has worked with a few dogs that serve the same purpose by placing a paw directly on his boot. Maurice moves his leg and the dog instantly turns to see where his trainer has gone. "They're smaaart," he says, smiling and drawing out the word for emphasis. Physical contact, such as this body-to-leg episode, is a second component of this method. The primary point of contact for training purposes is the neck, where Maurice employs a pinch collar for the majority of a dog's tenure at the kennel. He uses the collar as it was designed, applying only enough pressure to firm the collar on the dog's neck. It is a tool for communication, not enforcement or punishment. When asked about the role electronic collars play in a training program, he answers that his dogs wear an e-collar only after they are fully trained and know what is expected of them. Even then, he employs the e-collar sparingly. "No amount of electricity will make a dog do what it's not trained to do." Acknowledging the irony, he says, "They call them electronic trainers, but I've never seen one train a dog." 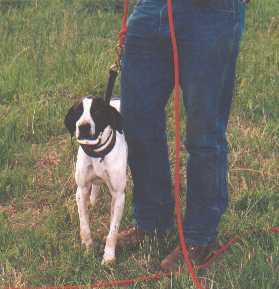 A tool used to communicate physically with a dog, and one that is not unique to Lindley's Kennel, is the trainer's hand. Again employing the "less is more" philosophy, Maurice is very particular about how and when he touches a dog in a training situation. He prefers to touch them with his fingertips rather than his entire hand, stroking very lightly in locations along the dog's topside. The actual point of contact, whether the shoulder, the back, or the top of the head, isn't as important as the way the dog is touched. Gentle, rhythmic contact communicates to the dog that he has done well, yet avoids getting him overly excited or otherwise distracting him from the task at hand. Affection is also meted out in small doses. Dogs often stand on their hind legs, shamelessly soliciting attention from the trainer. Maurice ignores their advances. "I use affection as a reward for behaving properly. If they don't act like they've been taught to act, they aren't rewarded." Not that he is a cold-hearted individual; on the contrary, he confesses to being downright silly with his own dogs around the house. But in the field, such playfulness detracts from the day's business, and physical contact, or in this case lack thereof, is used to convey this to the dogs. Virtually every wingshooter has been afield with the man who feels that his own voice is not only effective at controlling his dog, but imperative. Between lung-popping refrains of "whoa!" and "come!" he instructs the dog in every move short of which foot to lift next, often mixing four or five commands in a single breath. While a person with a stout sense of humor can find amusement in this, it is usually quite annoying and has the potential to wreck an otherwise pleasant day afield. On top of that, it generally has little of the desired effect. Contrast such a scene with the one described at the beginning of this article, where the only sounds were those of the dog and handler parting the brush, the breeze tickling the leaves of the trees, and the flutter of eager wings as a bird leaves the grass. More palatable to say the least, more effective to express it accurately. When Maurice lost the hearing in his second ear, he agonized for several days over the future of his livelihood. A spiritual man, he ultimately decided to place his fate in God's hands, stop worrying about the future and go back to training dogs. His incredibly positive nature spills over when he reflects on that decision. "If God shuts a window or a door, the one he opens is ten times better," he asserts. Indeed a condition that at one time seemed to place his career in jeopardy led to a new and better approach, one that works exceedingly well for him and for the dogs he tutors. He feels that the biggest advantage to his new approach is that the dogs understand it, ironic when he notes that the biggest disadvantage is that so many people have trouble understanding it. "So many of them want a recipe," he laments. He explains that they are looking for a step-by-step set of instructions that result in a finished gun dog. But training a dog bears little resemblance to cooking a pot roast. Dogs are living, breathing, thinking beings that have something to say to a trainer who is astute enough to listen. And so Maurice Lindley goes about his work, listening with his eyes and speaking with his hands. Day after day, a nondescript field is filled with conversation, and rarely a word is heard. Maurice Lindley trains and breeds pointing dogs in Piedmont, SC. He can be reached via phone at (864) 243-3583 or via e-mail at Southerngundog@aol.com.